The LeFun Wireless Surveilance Camera IP Cam Nanny Cam has WiFi capabilities. You can use your Smartphone, Tablet, or PC to check your monitoring, since it can be accessed via Wi-Fi. This monitor is able to monitor one or multiple devices at the same time, through a password identify feature. This monitor has a 720P High Resolution lens that is made to have the best image and video recording quality combined with clear HD video and digital automatic zoom. It has a video recording function that includes fast forward and playback via a local micro SD card. Some other features include wider angle 350 degrees (Horizontal), and Tilt 100 degrees (Vertical), Remote Pan/Tilt, Intelligent Digital Zoom, and IR LED Night Vision up to 32 feet. The built-in microphone and speaker allow for voice communicating between the APP and camera sides. This means that you can keep in touch with your baby at anytime. You can choose to see her face, hear her voice, and let her hear yours. 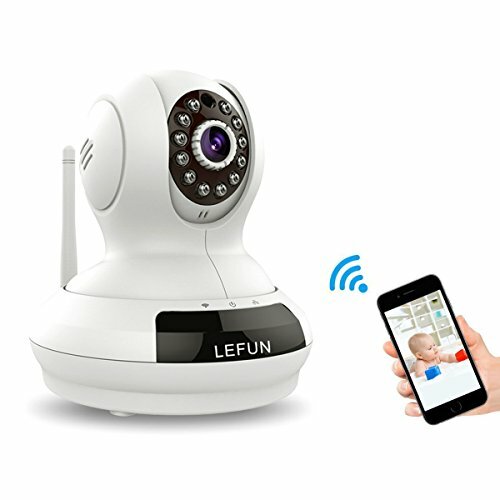 The LeFun Wireless Surveillance Camera IP Cam Nanny also has an intelligent motion alerts feature which means that you can receive message alerts and snapshots from a mobile app. An easy to place and use plug and play system quickly installs and sets up with this wireless surveillance camera. The connection uses a financial level encryption technology that lets you connect to any device via a secure and safe network. All of the cameras have CE, FCC, and RoHS certification. A full one-year warranty support is provided by LeFun. As of this writing there were 1,914 customer reviews and 982 answered questions on Amazon. This is a very good number to get a good feel for this monitor. I've read the reviews and answered questions and condensed the results here. I hope that this makes it easier for you to pick out the monitor that will best fit your needs. "This camera has a sleek design and the surface finish is great as well. The build is solid and durable. I like the fact that this camera can cover a large area since it can rotate 350 degrees horizontally and 100 degrees vertically." "...has lots of features for easy communications and home guarding. First of all, it has real-time activity alerts and it can send message to your phone once it detects motion in your house. Second, the two way audio function allows you to talk and communicate with the person in front of the camera. Since the sound is pretty loud, you can hear it without problems even if you are far away from the camera. Last but not least, it has strong IR led allowing you to watch 30 feet away during night. Awesome feature." In the area of reliability, this monitor had mixed reviews. While some said it was very reliable, others said that it lost WiFi connection often and the longevity of it was not good. The size of this monitor seemed to be a nonissue with people who bought this monitor. The dimensions are 5.31 x 4.92 x 5.12 inches with a weight of 0.2 pounds. "Anyone who has used cameras knows that set up can be a long and tedious project. My husband and I have used numerous brands and models. We always based our decision on the features each camera offered. We have invested literally thousands of dollars on cameras that now sit in a closet unused. I have spent hours on the phone with technicians, customer service, and anyone who could help set up our cameras. After my experiences, in all honesty, I dreaded the setup process. I cannot believe LeFun has made it this easy to set up a camera. It literally took me under a minute to get the camera connected to my Wi-Fi and was able to use it within a half an hour. The longest process with the setup on this camera was waiting for the app to download! This camera has been the easiest, most convenient camera to setup!" "Very flexible and easy to use. I recommend this product because it is 100% safe and useful. Will buy it again since it has a very affordable price." I liked what I read about this monitor. The price is very low, so it's affordable for most people. The durability and longevity are questionable. But if it lasts for awhile, at least you aren't out too much if you have to eventually purchase another one. I can't see how you could go wrong with buying this monitor for your baby or home security needs.